Outdoor workers can be exposed to various species, such as snakes with venomous bites, insects that sting and toxic plants, which can result in a visit to the emergency department after only a moment of physical contact. Exposure may cause an allergic reaction that is mildly uncomfortable or debilitating pain requiring immediate medical attention.The specific types of hazards vary depending on the nature of the outdoor work being performed, geographic region, season and duration of the job. However, safety officials and plant and animal experts advise people who work outdoors to take appropriate precautions when on the job. 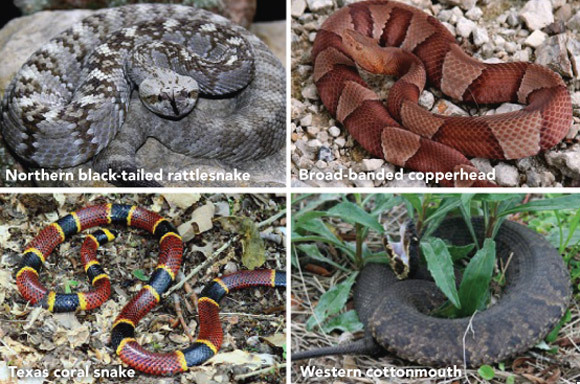 Rattlesnakes, copperheads, coral snakes and cottonmouths (also known as water moccasins) are venomous snake species found throughout the United States, according to the Centers for Disease Control and Prevention. Venomous snakes can live near rocky areas, forests, swamps and bodies of water, as well as woody or sandy marsh areas in the southern parts of the country. Rattlesnakes can be found near logs, boulders and mountains, prairies, and beaches. Anyone performing outdoor work in these environments should receive training on hazards involving snakes. Rattlesnakes make up the largest population of venomous snakes in the country, according to CDC. Contrary to what people may expect, “they don’t always rattle. You can’t rely on their signal that they are there, so you have to [look around] before you go into an area; you have to do a lot of house cleaning to check if a rattlesnake is there,” said Todd Wilson, who worked as a structures superintendent during a construction project on the Olivenhain Dam, located near Escondido, CA, where rattlesnakes are present. Before starting any work on a jobsite, employers should survey the area to look for evidence of snakes, said Dr. Edward J. Wozniak, regional public health veterinarian for the Texas Department of State Health Services. He said supervisors should gather any shed snake skin to help identify which snake species may be present. “All it takes is a few segments of it,” he said. “With rattlesnakes, if you just have a few inches of it, you can identify it.” Wozniak also suggested inviting an expert to the site to show employees snakes that are native to the area. “One of the first things the employer needs to do is instruct their workers not to handle them,” said Brenda Jacklitsch, a biologist at NIOSH, adding that if a worker sees a snake, he or she should let the snake move along, alert co-workers that a snake is in the area and warn them to stay away. “Even if it’s not a venomous snake, a snake bite could carry a lot of bacteria and it could be infectious,” Jacklitsch said. When removing debris, pick up the items with a tool, such as a rake or hoe, and always pull the object toward the body. “Use tools to pick things up under edges you can’t see under. If you pick up a flat piece of debris on the ground, pick it up on the far side,” Wozniak said. That way, if a worker unexpectedly uncovers a snake, the object will be a barrier between the two and will help protect the worker’s legs, he noted. In the event of a snake bite, medical professionals need to identify the species of the snake. “If you can at least be able to identify it, then you’re at a point that you can select an anti-toxin,” Wozniak said. Instruct workers to use their cell phone’s camera function to take pictures of snakes, he said. If a worker is bitten by a snake, keep the victim still and calm to slow down the spread of venom, and lay or sit the person down with the bite at or below the level of the heart, Wozniak said. The victim should be given medical attention as soon as possible. Administer first aid if the victim cannot be taken to the emergency department immediately. If the bite is on a limb, wrap the bite with a loose-fitting clean, dry dressing and immobilize the limb, if possible, he said. “Mark the advancing edge of the swelling with a marker at 15- to 20-minute intervals. This will help the treating physician with determining the bite severity,” Wozniak said. 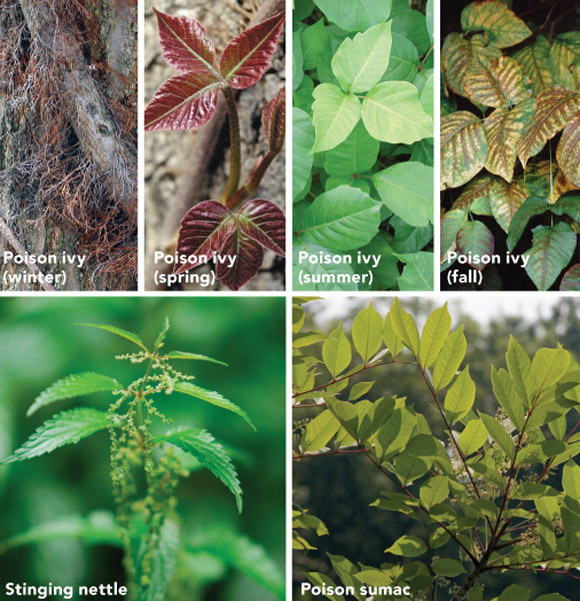 Poison ivy, poison oak, poison sumac, stinging nettle and poison hemlock are among the plants that can cause skin irritation lasting a week or more, according to the U.S. Forest Service. Irritation can be caused by brushing against a plant or from secondary contact with contaminated clothing. Poison ivy is a plant that looks different throughout the seasons. Young leaves have a reddish tint, old vines are very hairy, and in the late summer and fall it will have green to white berries on the vines, according to USFS. “Prevention is your best protection because if you can identify [poison ivy] you won’t get into it,” said Wendy Cass, botanist at the Shenandoah National Park in Luray, VA, adding that poison ivy grows along trails and buildings, on roadsides, and up trees. Workers should wear long-sleeved shirts, pants, hats and gloves when performing outdoor work near toxic plants, said Jim Miller, emeritus research ecologist of invasive plants for USFS. In addition, Miller recommends wearing eye and face protection, such as a facemask or goggles, as irritation can occur if workers are exposed to dust and pollen from certain plants. “Poison ivy can remain on a surface for weeks, maybe months. It can definitely hang on to your equipment for a long, long time,” Cass said. “It’s best to treat whatever has been in contact with poison ivy as if it has been contaminated.” Cass advises workers to wash their hands and equipment as often as possible. “I think it’s important just to warn your employees it’s sneaky; if just a tiny piece of poison ivy or a leaf goes into your glove and rolls around all day, you’re going to get exposed,” she said. If exposed to a poisonous plant, a worker should immediately rinse his or her skin with rubbing alcohol, specific plant washes or degreasing soap (such as dishwashing soap) – and use lots of water, CDC advises. “You want to scrub under your nails, and once you think you’re clean, you can use things like calamine lotion and other things that might help with the itching,” Jacklitsch said, adding that antihistamines may help a person deal with inflammation and swelling, but should not be used while operating machinery. Bees, wasps and other stinging insects are found throughout the United States. These insects will sting if they are disturbed as they go about their activities, especially while foraging for food, according to the University of California, Davis. Exposure to a stinging insect can cause a severe allergic reaction. “If you’re going to be in an area where there are bees or wasps or hornets, [it is important] to constantly keep your eyes open,” Wozniak said, adding that workers should watch for a pattern of movement – for example, if they see multiple bees or wasps going to or from a specific area. “If you start seeing some of these things, that’s probably an indication that a wasp or a bee [colony] is going to be there,” he said. Workers who are stung can experience a dangerous drop in blood pressure, and fluid can build up in the lungs, causing shock. Workers who are allergic should carry an epinephrine injection, also known as an epi pen, at all times. Employees who think they may be allergic should go to their doctor for testing, UC Davis advised. An insect sting can be particularly dangerous, especially if it occurs on the neck or mouth, because swelling can cause a person to suffocate, UC Davis warned. The main concern for workers is open bottles and cans and trash, said Michael Rust, professor of entomology at the University of California, Riverside. Workers who eat outside should use caps for bottles and cover all food items with a lid to prevent attracting insects, he said. If stinging insects, particularly wasps, discover accessible food, they may hunt long after that food source is gone, according to UC Riverside. If an employer intensively traps an area, the number of insects will be reduced, but make sure to set traps about 100 feet away from eating areas or other areas that need to be protected, Rust said, warning that certain traps are meant to attract yellow jackets and may cause more harm if placed too close to an area with food. Employers who want to remove a nest or hive should take necessary precautions to protect against an attack from an angry bee or wasp colony. “Typically, when you’re doing that kind of nest treatment, it’s probably a good idea to have a bee suit on, before you do any kind of a treatment,” Rust said, adding that professional help is best in many circumstances when removing hives and nests. If a worker is stung by an insect, the area must be cleaned with soap and water, and the stinger should be removed with gauze or by using a fingernail, according to CDC. Ice may be applied to reduce swelling, but scratching can cause increased swelling, itching and possible infection. Ticks present another concern for outdoor workers. They can cause Lyme disease when they attach themselves to a host and feed for six to 13 days, according to Texas A&M University in College Station. Ticks may be found in tall grass areas, shrubs, brushy areas, river bottoms and woodlands. They are most active in the spring, summer and fall, but can be active for the entire year in warmer parts of the United States. The Hoosier National Forest in Bedford, IN, recommends tying or taping pant legs tight around the ankle to prevent ticks from crawling inside, and tucking in shirts to make ticks easier to spot and remove. Workers also can wear light-colored clothing to make ticks easier to spot; clothing should be washed regularly to kill any remaining ticks. Repellents containing permethrin work well at protecting against ticks, but workers should avoid applying it directly to the skin, according to Texas A&M. It should instead be applied to clothing. Repellents containing DEET will protect the exposed skin of a worker, but it will not stop ticks from crawling underneath clothing. When using either repellent, workers should read and follow all instructions on the packaging. Workers may not notice a moving tick on their body or even feel a bite, so clothing must be checked regularly. According to CDC, tweezers should be used to remove attached ticks with a slow and steady pull away from the body. Twisting and jerking can cause the mouth parts of the tick to remain on the skin. If this occurs, use the tweezers to remove any remains. If a tick is removed from the skin, keeping the tick for a few weeks in a vial labeled with the date and location of the bite may be helpful to medical professionals. A worker who develops a rash or fever within several weeks of removing a tick needs to visit a doctor.